Poodles are intelligent and vibrant dogs, no matter which size you get! Owners across the world concur constantly. Take a look at these 25 fabulous tips and facts about them. Poodles are second to the Border Collie, with their intelligence. Poodles are highly intelligent which makes them highly easy to train. When you bring home your Poodles for sale, sign them up for obedience training as soon as possible. This keeps them from being bored and destructive! They may be picture perfect, but they have some less than attractive habits. Poodles are notorious for nipping at heels – yep little ankle biters! Miniature Poodles and Toy Poodles are mischievous than Standards. Poodles go through an rather hyper stage from ages 8 weeks to 1 year. 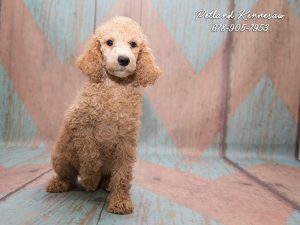 Once the Poodle puppies for sale that you’ve purchased are in your home, you want to be sure to bathe your Poodle once every 3 weeks. This allows time for the natural body oils to nourish the hair and skin, but not clog their pores. To avoid tear stains, in particular with lighter colored Poodles for sale, gently wipe their faces daily with a washcloth and warm water or specially designed pet wipes. Like some humans, female Poodles can sometimes experience hair loss due to hormonal changes associated with having puppies. The AKC hairstyle (or clip) for showing Poodles for sale is the “Lion Trim” and it comes in 4 variations: the Puppy Clip, the Continental Clip, the Modified Continental Clip, and the English Saddle. There are other clip variations not recognized for showing that include the: Kennel Clip, Lamb Clip, Bikini Clip, Poodle Scandinavian Clip, Dutch Clip, and the Sporting Clip. The Poodle has an elegant build with a long and straight muzzle. The ear type in Poodles is flat and hangs close to the head. A Poodle’s walk is described as light and springy. While your Poodles are known to be hypoallergenic, ironically over 20% of them suffer from allergies. Contact, food, inhalants, fleas, and bacterial are what can trigger allergies in your Poodle. The Shitzpoo is a crossbreed of a Shih Tzu and Toy or Miniature Poodle. They are simply a dream, with their fluffy hair and captivating eyes. He is cute and alert absolutely adorable. They originated in the United States, with the hopes of creating a new hypoallergenic dog. The Shitzpoo was also crossed to be small companions, just enough to be lap dogs and be carried around, but not too fragile. They normally weigh between 8 to 18 pounds and live 10 to 15 years. The Shitzpoo tends to overeat, so you must carefully monitor their eating habits. He needs to maintain high quality diet of dry food. This is necessary because this crossbreed tends to have dental problems, including premature tooth loss. Dry food can help to prevent this, as well as caries, gum disease and bad breath. Though they typically have a cheerful disposition, these precious pups are quite stubborn, in particular when it comes to training! You want to institute crate training with them, because it works best. They are treated motivated, so using them to eventually follow your commands is suggested, because they have relatively short attention spans. The Shitzpoo is a playful and energetic dog. They are rather content playing with toys around the house and often! They are good in households with children, but not a young toddler age. 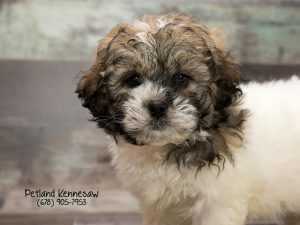 Because the Shih-Poo is a crossbreed, some are accepting and affectionate toward strangers while others are reserved and shy. One thing is for sure – they love to cuddle with their owners like their Shih Tzu gene! The American Kennel Club does not recognize the Shitzpoo as a true breed of purebred dog. They are currently recognized by the American Canine Hybrid Club, Designer Dogs Kennel Club, Dog Registry of America, Inc., International Designer Canine Registry and the Designer Breed Registry. Whether you’re a new pet owner with your very first pet. A seasoned pet owner with one or more pets within your lifetime, we understand that you may not have all of the answers. There will undoubtedly come a time when a situation arises and you need immediate, non-life threatening help. That’s when Solutions Pet comes to the rescue! They have the pet solutions you need! They can help you out with many different types of issues, so you can get on with your day. They keep detailed records that will keep you up-to-date on current issues, diagnoses and warranty questions. Having the ability speak with someone who knows your exact situation at any given time, gives you the peace of mind you absolutely deserve. Solutions has wonderful people working round the clock to make sure that nothing falls through the cracks and you don’t go too long without getting the information you’re looking for. With the store being so busy, it doesn’t help anyone to be shuffled around or ending up with misinformation or forgotten issues. They work diligently to keep everyone informed and in the loop on every important issue or concern. They can work directly with clients, veterinarians and more to have a multi-faceted approach for providing pet solutions from difficult to easy issues. Solutions helps us keep our clients and their pooches happy, healthy and looking forward to a beautiful friendship together! Solutions.Pet has live representatives available Monday – Friday from 9am to 8pm EST, Saturday from 10am to 8pm EST, and Sunday from 10am to 6pm EST. Along with 24 hour, 7 day a week unlimited online concern submission with a 24 hour response time to get the answers you desire conveniently and diligently. We promise to provide the fastest and most exceptional service to answer all of your questions and concerns. 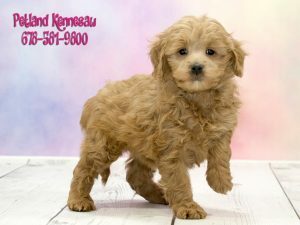 The Mini Goldendoodle puppy is a hybrid mix between a Miniature Poodle and the Golden Retriever. They have several other names, such as Groodles, Goldie Poos, and Golden Poos. Goldendoodles were specifically bred to be low-shedders and hypoallergenic. The coat of the Mini Goldendoodle puppy will vary depending on the dominant parentage. It can be straight, wavy, or curly. There are also different coat colors that may be blonde, white, tan, chocolate, café, silver, black, red, phantom or even a mix. A Mini Goldendoodle puppy will need frequent grooming visits, because their coats may become easily tangled. Bathe as necessary whenever his coat becomes dirty. The temperament of the Mini Goldendoodle tends to be highly intelligent and easily trainable. It’s really no wonder because both the Poodle and Golden Retriever are known for their incredible intelligence. Again, both breeds are affectionate and make excellent family dogs, so it’s no surprise that the Mini Goldendoodle puppy would have these same endearing traits. These pups love human interaction and do not like being left alone for long periods of time. They aren’t excessive barkers, but they will alert you when someone is at the door or approaching! The Mini Goldendoodle puppy may be prone to some of the same health problems as Poodles and Golden Retrievers. Some of these health problems may include cataracts and hip dysplasia. Goldendoodles are also known to suffer from some food and skin allergies and also are prone to bloat. They have a lifespan of 9 to 15 years. The Mini Goldendoodle puppy will vary from 15 to 35 pounds. It sounds large considering the word “mini” but keep in mind their Retriever ancestry. Their heights are 13 to 20 inches. We have other animals for sale! Petland pets range from puppies to kittens to parrots and to other small animals. For years, we have been known for being full service and focusing on all types of different animals, because we recognize that everyone has their own unique preference. From bunnies, guinea pigs, ferrets, and all different types of hamsters. We have all of your small cuddly animals for sale. Small animals for sale can be and are usually an easier starter pet for a young child. They are also a great low maintenance pet for a teacher and their classroom, thus instilling compassion for animals in young children at a young age! We also carry an array of small animal supplies, so you can properly take care of your small animal. We have top-of-the-line cages and habitats for them to live in that are fun to look at and easy to clean. We also carry all the latest and greatest toys, treats, and high-quality foods for all of our small animals, so you can strengthen the bond between animal lover and pet. All of our Petland pets are in an open petting style environment, so you can come down and socialize anytime you would like. Our small animals are well socialized, while being in our store. Unlike other pet stores, our animals are accessible as long as they are handled with care. They are not kept or locked up behind glass enclosures, where you aren’t allowed to pick one out based on their perceived personalities. Socialization is very important, because it makes our small animals better companions. Our customers are more informed pet parents, before they take one of our little guys home! In short, we want to match the right pet with the right owner and meet the needs of both, that’s the Petland pets motto! Indeed, there are many breeds that are large, huge even, but none can truly compare to the Mastiff! The average height of a male Mastiff is 30 inches and their average weight is 175 – 190 pounds. Female Mastiffs usually have a height of 27.5 inches and weigh between 175 – 195 pounds. With respect to heights, they’re considered to be the third tallest dog, behind the Irish Wolfhound and the Great Dane. Mastiff puppies for sale are not uncommonly purchased to be guard dogs, because the mass of height of them often makes the appear formidable to strangers. On average, Mastiffs will live for about 10 years. However, there have been some exceptions to this norm. The longest living Mastiff was a female named Kush, who resided in Australia and lived to be over 15 years old. Mastiff puppies for sale suffer from health risks associated with their breed, much like any other dog. The most common health risks include joint and structural problems, heart conditions, eye diseases, bloating, and cancer. 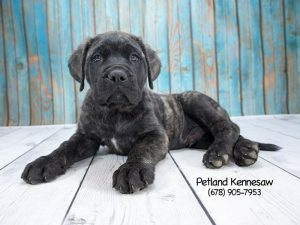 The joint and structural problems mean that you cannot overfeed your Mastiff puppies for sale that you’ve purchased, once they’re home and in your care. They are prone to hip dysplasia, which means their thigh bones won’t fit into the hip socket properly. Over time, it can result in arthritis. Regarding bloating, it is not uncommon for other dogs, but it’s almost certain for Mastiffs. Mastiff puppies for sale come with associated costs, much like other dogs. You should be prepared for vet bills, training, the cost of food, toys, maybe some clothing, and other optional choices like pet sitters or walkers. Mastiff costs can be much more expensive, however. Because of the aforementioned health risks, their heart costs are more. And because of their massive size, you’ll certainly be paying for food! They will need high quality food to keep them healthy, thus lowering any potential vet visit bills. There’s always the comparison of dog and cat owners. Some argue that cats are easier to care for and others argue that they aren’t. While it’s very true that cats are pretty independent by nature, this doesn’t mean that they can solely take care of themselves! Before you purchase a cat for sale, here are some tips you should know and perhaps ponder. Do you have the time and lifestyle for a feline? Are you too busy for a cat? As we mentioned, they are more self-sufficient than dogs, however some cat owners have complained that they are too busy for cats. It takes time to groom them. Depending on the breed, some are rather active and need more stimulation than most can fathom. This is especially true for highly intelligent and active cats like African Bengals. We recommend that you do your research. Look online and ask around to other friends or family members. We have to ask. Do you have cat allergies? Does anyone in your home have even the slightest allergy? Before you purchase a cat for sale, you want to check and double check that you nor any of your family members suffer from cat allergies. Unfortunately, there aren’t “hypoallergenic” cats like there are dogs. There are some that have low allergens, but those are far and few between. Do your research and consult with your doctor, before you bring your cat for sale into your home. Before you bring home a cat, be sure to have already secured a veterinarian. Make the necessary appointments and checkups, for future dates. No worries though, our cats have already been immunized and had the proper checkups! You’ll need to decide if you’re going to neuter your cat or not. If so, that should be an appointment made immediately, as it’s predicated on their age. This decision can make the difference between having a happy and healthy cat or one that is constantly spraying your furniture or trying to escape incessantly. While you’re at it, you should also invest in pet insurance. It’s better safe than sorry, we say! 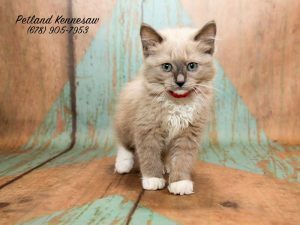 As with any pet, there will be certain items you’ll need in the beginning to get your new cat for sale comfortable and acclimated to its new home. Firstly, you’ll want to invest in getting really good, high quality litter boxes, at least two. It’s their second home, so-to-speak. They’ll be in there often and you want to make it as comfortable as possible. We recommend covered boxes that give them the privacy they need, yep need! Always keep the box clean for your and your cat’s comfort. Consult with one of our knowledgeable staff members on the types of litter boxes and kitty litter to purchase. Lastly, cats love to play albeit not as much as many dogs. They are certainly not just docile animals. Bring out some feathers, toy mice, string and fuzzy pipe cleaners and they’re go crazy swatting and pouncing away! Their toys are rather inexpensive, which is a plus. You want to make sure that you keep plenty of them around so that they’re happy and not bored. One of the most important purchases you’ll make for the cat for sale who’s joined your home is a scratching post! If you want to save your furniture get one, or two. Cats love them and they also love sitting high atop things. Sprinkle some catnip about it and you’ll have one happy camper! We’re here to answer your questions and give you suggestions. Contact us today with your concerns. Nearly everyone loves the Golden Retriever! As puppies, they’re adorable and they grow into being everyone’s friend. They are goofy, gentle, and playful. They’re extremely intelligent and eager to please, as they crave human interaction. The Golden Retriever that you’ve joyfully added to your home will need daily exercise to burn off their energy. Challenging obedience lessons and active games are great entertaining exercises for them. They enjoy games that involve retrieving and love to carry items in their mouths. These pups mature very slowly. 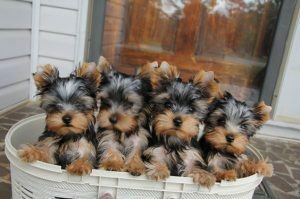 They are well known to retain the characteristics of a puppy personality until they are 3 to 4 years old. You shouldn’t ever shave your Golden Retriever puppy. Her double coat serves as natural protection from heat and cold. The Guinness World Record for loudest bark is held by a Golden named Charlie at 113.1 decibels. Amazingly, Goldens can be trained to detect epileptic seizures, for up to 1 hour before they actually occur. According to the American Kennel Club, the Golden Retriever for sale or adoption is the 3rd most popular breed. A Golden can run 20-30 miles per hour. We can’t figure out how a 10 month old Golden Retriever puppy named Cody ate an entire lightbulb and passed it completely intact?! 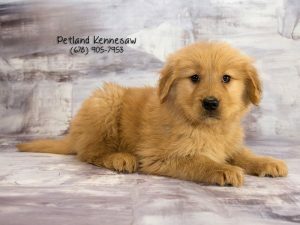 To provide further definition to the breed, Newfoundlands, Bloodhounds, Labrador Retrievers, and Red Setters were also later added in the breed mix. 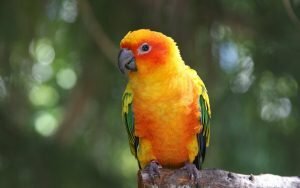 Parrots are beautiful and colorful birds that are found all over the world. They are so diverse in so many ways. They come from various parts of the world including Central America, Mexico, South America, Asia, Africa, and Australia. There are more than 300 species in the world today, however unfortunately some of them are endangered. If you’re looking for parrots look no further than your nearest Petland. Here are some fascinating facts about parrots around the world. Cousin to the kakapo, the kea is also a unique parrot. You won’t find these parrots as they live in high mountainous and cold environments, conversely to most parrots that live in warm places. They are just fine, however, because they have thick feathers and round bodies keeping them warm and preserving their body heat. Here’s an even more fun fact. These parrots can be pesky, because of their high intelligence. They’ve been known to pickpocket wallets, passports, jewelry, and even gum! Long before parrots for sale in GA was an option, they’ve been kept as pets for nearly 3,000 years. They were first pets of ancient Egyptians, then Native Americans, and then Chinese. They were brought to Europe in 300 BC, often kept by the rich. In modern day, parrots hold the record of being the most popular pet birds in the world. Their beaks prove it, because they are not only large but have incredible strength. The beak of the hyacinth macaw is strong enough to crack macadamia nuts, which are undoubtedly considered to be the toughest nuts to crack. They even have the ability to crack open a coconut! You’ll need to provide food for the parrots that you bring home, but don’t worry about feeding them. These bad boys can do that easily…with their feet! Parrots are the only birds that can do so. In addition to their beaks, their feet are strong, as well. They have what’s called zygodactyl feet. They can cling to branches for ridiculous amounts of time, even hanging upside down effortlessly. Their feet are likened to human hands and can be either left or right handed. No need to give them a hand. They’ve got it covered! These beauties have the ability to move the feathers on their heads, making them quite personable pets. They’re able to maneuver them much like dogs can move their ears. Their head crests are raised when they’re excited, scared, or angry, in addition to when they’re simply taking flight or landing. All other times, their feathers lay flat. Fun Facts about the little fluffy clouds, Bichon Frise! The Bichon’s name means “curly coated,” in French. To maintain their fluffy coats, you will need to brush and groom your dog daily. This is very high maintenance work requiring a blow dryer and some trimming. Bichon Frise puppies for sale are purchased because of their coats and their owners typically let groomers do that fancy work! Young Henry III of France was so connected to his Bichon Frise that actually he carried his pup around his neck, on an ribbon adorned attachment that looked like a basket. He inadvertently started a fashion at court, leading to the name “Bichonner..” It means to pamper or make beautiful. 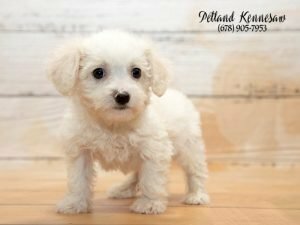 Bichon Frise puppies for sale are so popular, because they are extremely gentle and playful, small companion dogs, that makes an excellent family pet. Artists frequently included the Bichon Frise in their paintings. Titian, Sir Joshua Reynolds, and Francisco Goya portrayed them. The Bichon Frise is a descendant from the Barbet, an old breed of Water Spaniel, from the Mediterranean region of Europe. They are said to be related to the Poodle. Bichon Frise puppies for sale are intelligent and sociable. They don’t like being alone for long periods of time, for they love to be with people and often suffer from separation anxiety. The Bichon is often recommended for people who have dog allergies, because they have a coat similar to a Poodle’s coat and shed very little. While they make very good apartment dogs, they do require regular daily exercise and would appreciate and some outdoor playtime. In adult dogs, their coats are completely white, but puppies can be born in butter, apricot, or gray shades. Bichons puppies for sale are born toothless, deaf, and blind. The pups do not fully open their eyes until they are at least 12 days old. The Bichon Frise dog has an average life span of 12 to 15 years.